Shaving for many is a daily ritual. For some, it is avoided in favor of letting facial hair grow unhindered. For those that want to grow a thick, healthy beard, could there be benefits to shaving off your beard every once in a while? Should regular shaving be a part of your face care routine regardless of your facial hair preferences? We are going to explore some of the benefits of shaving, as well as any negative effects of shaving. Some of the obvious benefits of shaving are that it removes unwanted hair. If you’re someone who enjoys a clean-shaven look than this is the obvious choice, but if you prefer a beard then shaving is something which happens at long intervals. While we are discussing the desire for a clean-shaven face to possibly help your beard long term, what are the other options for facial hair removal? Waxing is always an option. While waxing will produce long lasting effects without the risk of razor burn, it can be painful, especially in the facial region. It can also be expensive. Waxing is not a traditionally preferred method of facial hair removal for men, and we do not recommend it unless you are into the pain. What about those of us who are already into beards? Can shaving regularly help grow a thicker, healthier beard? Can it damage the follicles? Is it bad for skin? The answers to these questions can vary. It is a pretty well-known thought that shaving can cause hair to grow back thicker and coarser than before, but this is only a myth. This is due to the exposure of a blunt edge on each strand of hair. This causes the hair to appear darker and thicker for a while, but the hair is not thicker than it was before. Depending on the type of hair the shaver has, this could be a good or a bad thing. For those with an already thick or especially wiry beard, this could mean an unmanageable beard and an added level of difficulty to their daily face care routine. What about the other effects of shaving? Face care is a hot topic for men right now, from the introduction of male skin specific lotions and skin care products to the latest trend, “beard facials”, it is apparent that men are becoming more aware of their skin and the care necessary to help avoid unnecessary wrinkles and imperfections. How can shaving affect this? 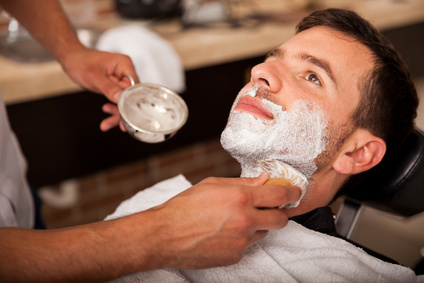 It is shown that regular shaving can actually have a rejuvenating effect on skin. A new procedure for women involving shaving of the face is gaining steam among dermatologists and the country’s top spas. The procedure, known as “dermaplaning”, involves a razor blade much like the ones used in a typical face razor. The blade is carefully scraped down across the skin of the face in long sweeping motions. This removes dead skin cells and promotes healthy blood flow. The procedure is said to work, and produces soft, rejuvenated, exfoliated skin without the harmful effects of chemical peels. Men can get the same effects by shaving regularly. The sweep of the razor not only removes hair but it also removes dead skin cells, leaving behind fresh, soft skin. Regular exfoliation, like this, can lead to a smoother, less wrinkled face as a person ages. So in answer, YES shaving as a regular part of your face care routine can be good for skin. To ensure that you get the best out of your shave, and to reduce the risk of ingrown hairs and razor burn, there are a few steps you should take before getting started. Perhaps the most important step is that you ensure that you are using a new, sharp razor. A disposable razor typically lasts for about three uses. If you have particularly coarse hair, this may be less. If you have been growing your beard out, you may want to trim it before you begin the shaving process. Ideally, hair should not be longer than half an inch before you take a razor to it, this prevents your razor from becoming clogged and helps eliminate the need to shave the same spot repeatedly, which could cause razor burn. 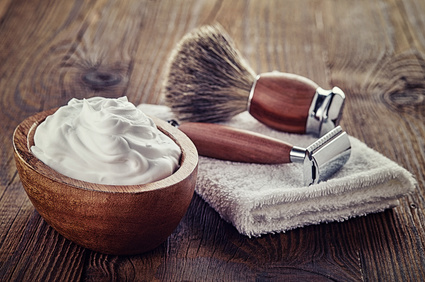 Make sure to use a quality shaving cream, preferably one with moisturizing properties. When you have finished shaving you may use an aftershave liquid. The benefits of such a product can vary, but typically they contain alcohol or another antiseptic property. If you have very sensitive or dry skin, it is recommended that you skip this step. Last, it is crucial that you moisturize the area preferably with a gentle, unscented product. It is also crucial to use a daily SPF, especially on freshly shaved skin. When the skin has just been exfoliated, it is more sensitive to the sun. By adding an SPF into your face care routine, you can reduce your chance of getting skin cancer, and reduce your chances of getting premature wrinkles and discoloration. As a 21st century man, it is beneficial to shave every now and then as a part of a well-rounded face care routine, even if you’re a beard fanatic! Review of top rated electric shaver! Review of top rated beard trimmer! Why Is My Beard Ginger?